As dusk settles in around the Horseshoe Falls in the City of Niagara Falls in Ontario, Canada, the water appears a deeper blue before dropping over the ledge. The sky above the Horseshoe Falls of the famous tourist attraction Niagara Falls, Ontario becomes darker as dusk begins to settle in around the region making the water appear slightly different in color. The foam in the waterfall seems to be a brighter shade of white while the river tends to take on a slightly darker blue tinge. 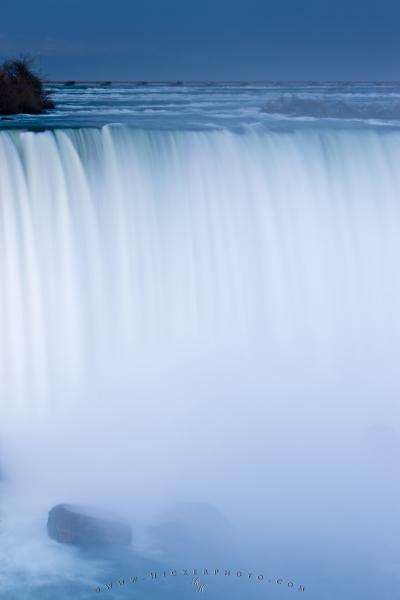 Horseshoe Falls along the Niagara River at dusk, Niagara Falls, Ontario, Canada. Falls in Ontario, Canada in the dusk lighting.